"Screechers," by E. Lucas, is a fun-filled picture book meant to be read aloud to pre-school children. The plot revolves around an alien family from the planet Screech (where everyone shouts to be heard) and their daily life, such as going to a restaurant, the doctor's office, and the seaside. The plot is interesting enough to keep a child engaged, and there are plenty of moments for humor. The characters are the members of the Screech family (e.g. Pa Pa Screech and Mo Ma Screech) and their dog, and they each have their humorous moments. The illustrations in the book are whimsical and entertaining and go well with the text; children will find the colorful images engaging and humorous. 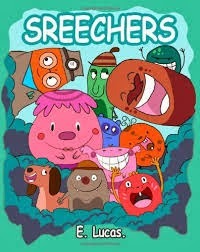 The real draw of the book is that the Screechers speak in a special language (e.g. Woo Woo Waa Whoo Baa), and whoever is reading the story aloud has to replicate the sounds, before reading the translations. "Screechers" is the perfect picture book for someone who wants to read a humorous story (with lots of funny noises) to a pre-school age child.